5/11/12. 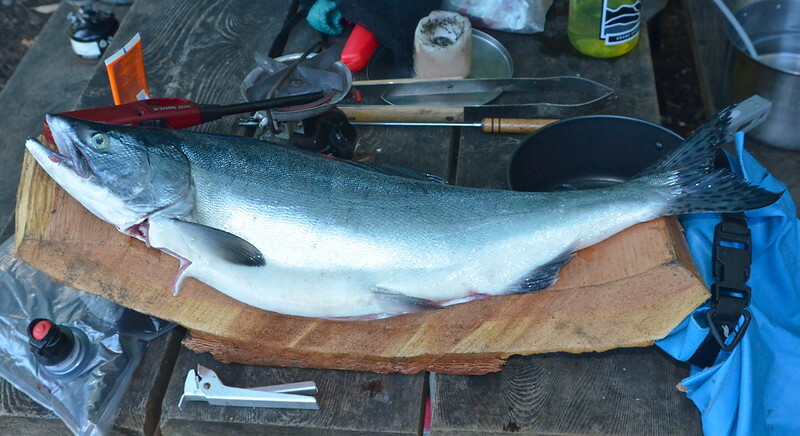 Pink Salmon on a stick of wood. While kayaking in the San Juan's this past fall, there was a very large run of Pinks (Oncorhynchus gorbuscha, from a Russian name for this species gorbuöa, горбуша). The local pod of Orca's feast on these fish as they move into Puget Sound, though we were not lucky enough to see them chasing this run. We were lucky enough to catch a few and enjoyed several wonderful meals. The Pink, interestingly enough are increasing in numbers lately since they are able to respond more readily to the changing climatic conditions in the Pacific Northwest (higher stream flows in spring and lower flows in summer) than other salmon which illustrates how well salmon as a species have developed specific adaptations over the eons to the wide variety of environmental changes brought about by glaciation in this area. what an awesome catch, literally! Very nice. What a great fish. Very nice. Salmon grilled on a stick works for me! Great shot! Great shot and submission for today's "stick" challenge!! My best friend and her hubby are avid fishermen and they would love this fish!!! Yum! --I mean--Great photo! Good use of stick! And thanks for the pink salmon lesson. Wow - what a catch (the fish & the shot) - just great! Gorbusha's very popular here. Dude this is brilliant absolutely genius !! LOVE THIS !! Best stick photography yet !!!!!!!!!!! !